Frankfurt - Anthony Yeboah is a Frankfurt football legend. 123 of the Ghana international's 223 top-flight appearances were with Eintracht, where he scored 68 of his 96 goals in the German top flight. In 1993, and again the following year, he was Bundesliga top scorer but for all his scoring exploits out on the pitch, Yeboah is remembered in almost equal measure for his groundbreaking achievements away from it. In the early 90s, together with SG Wattenscheid's Souleymane Sané and Anthony Baffoe of Fortuna Düsseldorf, he wrote an open letter drawing attention to the casual racism prevalent at the time both in Germany's football stadiums and in everyday life. Today, Yeboah's overdimensional likeness is to be found decorating the gable end of a five-storey Frankfurt apartment block – a symbol of the ongoing battle against racism and discrimination. Photographer Dominik Dresel and artist Mathias Weinfurter submitted the idea as an entry for the 'Keeping it in Mind' competition organised by the Frankfurt Fan Project, and were subsequently awarded a grant. They already had a particular building in mind, situated on the main train line between the airport and city centre. The connection to Eintracht Frankfurt's Commerzbank Arena passes by the 'Anthony Yeboah House' as well. The consortium that owns the building in Frankfurt-Niederrad, Nassauische Heimstätte, needed little persuading to give the proposal the go-ahead and Weinfurter spent the best part of two weeks on the large-scale artwork, with Dresel documenting the entire process. 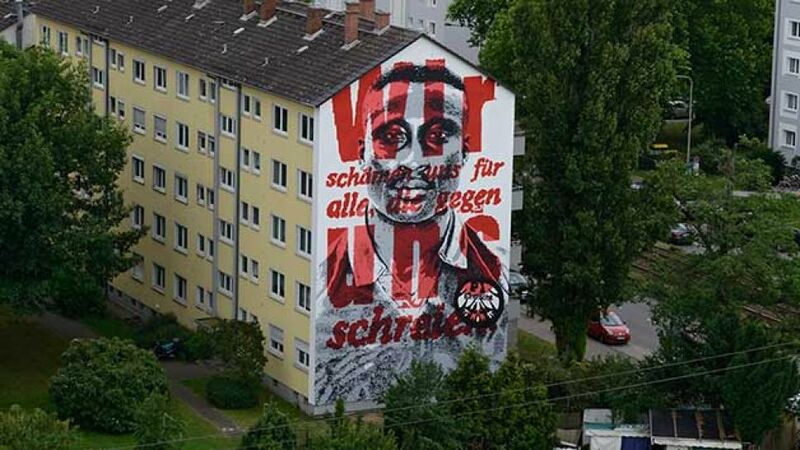 Superimposed in red over the portrait of Yeboah in an Eintracht shirt is the message, “We're ashamed for all those who shout against us” - a quote from the letter which had opened so many fans' eyes to a phenomenon they had barely given a second thought to. “There was huge interest in the idea right from the off,” recalled Sebastian Beck from the Frankfurt Fan Project. Not least from Yeboah himself, now 48 and living back in Ghana. Present for the artwork's official inauguration on 21 June, the former goalgetter supreme declared it “a great idea” before spray-painting his signature at the bottom. “The Tony Yeboah House has already become part of Frankfurt's cultural landscape. If you're using the train here, it's pretty hard to avoid,” said Beck, who passes it himself every day on the way to work and enjoys the response of fellow passengers: “The building's a real topic of conversation and a lot of people take a picture of it.” That in itself will be music to the ears of Anthony Yeboah, one of German football's pioneers in the battle against racism, antisemitism, xenophobia and all other types of discrimination over 20 years ago.